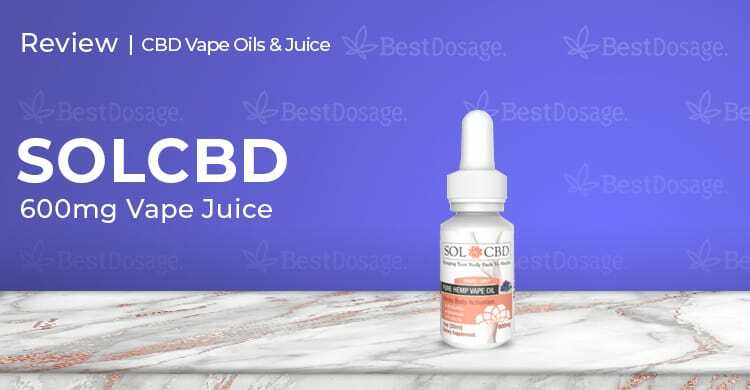 The SOL CBD oil 600mg excelled in instructions on the bottle, bottle, flavor, aroma of oil, flavor tolerance over a long period of time, sets in fast and lasts for the same time as any other CBD oil I’ve tried. I personally wasn’t in love with the flavor, so this won’t be the only vape juice I use, but it will be part of my arsenal. Flavor preference aside, it helped with anxiety, knee pain, and insomnia. That’s why we definitely recommend the SOL CBD oil, especially to those of you who like spearmint. Up next is our review of SOL CBD 600mg vape oil. Known for their popularity on social media, SOL has established itself as one of the market leaders in CBD. Let’s see if the SOL CBD vape oil is up to snuff. When CBD came on the market, SOL founders Larry and Oksana Ostrovsky knew they had to do their part and get the word out. The two have been spreading their knowledge of natural health products for over 8 years. Bringing this expertise to the CBD has its advantages. They have experiencing refining products to reach top quality results, and that’s what the aim is with SOL CBD. As part of their commitment to transparency, all SOL CBD vape oil and other products contain testing documentation. They’re 100% hemp derived and legal in the United States and most countries around the world. SOL CBD also maintains a 6-day money-back guarantee on their products, which is a huge plus, especially for those new to CBD. The SOL CBD vape oil bottle contains 60 servings. Each of those servings is packed with 33.3mg of hemp oil, and within that, there is 10mg of CBD. Theirs is a CO2 extracted, full spectrum oil that contains phytonutrients, enzymes, and vitamins. It’s a bit of a misnomer to call this vape oil, as it’s really vape juice, but you can use the terms interchangeably. The carrier is vegetable glycerin, which is known for good vapor production. The first thing we noticed with the all-white 600mg SOL CBD vape oil bottle was the easy to read instructions, sturdy top, and overall nice looking bottle. Nothing special, but it does the job. The first thing I thought of when I saw the flavor was grape mint was: “is SOL CBD a secret dentist organization? ?” Where, outside of a dentist’s office, would you see grape mint as a flavor? After I got over the ridiculousness of the flavor, I opened the bottle poured in the recommended ½ dropper of oil into my reusable vape pen. The vape juice has a nice smell and loads easily into any vape pen, I tried 3. Now, onto the taste. This vape juice was just okay in the flavor department and didn’t live up to its hype for me. On the plus side, the peppermint is not overwhelming at all for all of you that hate peppermint. When it comes to CBD vape juice, I rate my e-liquid on how frequently I can use the flavor without getting sick of it. This is my second straight week using the grape mint and I’m still happy. That’s a good sign and means the flavor grew on me some over time. SOL CBD recommends that you vape the oil as desired. Meaning don’t worry, the vape oil won’t hurt you. I’m not a doctor, but I am an experienced vape user. I can say that whether its one puff, two puff, three puff, or four, you don’t need to worry. You’ll stop when your body is happy, which is different for every person. Yet considering there is 10mg of CBD per serving, you can expect to consume somewhere between 1-3 servings daily. When you vape CBD juice it’s absorbed into your bloodstream immediately. This process allows for nearly four times as much CBD to enter your circulation. That means you can achieve the same beneficial effects with a much smaller amount of CBD. Our team found that the SOL CBD vape oil does in fact set in immediately. The downside is the peak of the effect lasts shorter than digesting CBD oil through your stomach. But the beauty of a vape pen is in controlling the dosage, experiencing fast effects, and the act of vaping a pen is fun too. You should expect the vape effects to set in within around 15 minutes, and to last for about a few hours. CBD, hemp oil, vegetable glycerin, organic peppermint oil, and organic grape oil. With their big presence on social media, you’ll get a quick reply if you reach out via Facebook, Instagram, and Twitter. If you prefer email, SOL CBD can be reached that way too, as well as through their toll-free number or the live chat box on their site. We’ve always had good experiences reaching out to their support staff. In this department, SOL CBD passes with flying colors. Free shipping on orders over $80. If your order is less than that, it’s $5.95 for shipping. Orders are shipped via USPS Priority mail and usually take 1-3 business days from coast-to-coast (orders shipped to Hawaii might take up to 7 business days). $79.00 for 60 servings. If you take the suggested 10mg of CBD per day, it will cost you $1.31/day. The SOL CBD oil 600mg excelled in instructions on the bottle, bottle, flavor, aroma of oil, flavor tolerance over a long period of time, sets in fast and lasts for the same time as any other CBD oil I’ve tried. I personally wasn’t in love with the flavor, so this won’t be the only vape juice I use, but it will be part of my arsenal. Flavor preference aside, it helped with anxiety, knee pain, and insomnia. That’s why we definitely recommend the SOL CBD oil, especially to those of you who like spearmint.